The Socioeconomic Component of the National Coral Reef Monitoring Plan (NCRMP) will gather and monitor a collection of socioeconomic variables, including demographics in coral reef areas, human use of coral reef resources, as well as knowledge, attitudes, and perceptions of coral reefs and coral reef management. The overall goal of the socioeconomic monitoring component is to track relevant information regarding each jurisdiction's population, social and economic structure, the impacts of society on coral reefs, and the impacts of coral management on communities. NOAA's Coral Reef Conservation Program (CRCP) will use the information for research and to improve the results of programs designed to protect coral reefs. In 2007, the NOAA Coral Reef Conservation Program underwent an external review by an expert panel to provide an independent assessment of the CRCP's effectiveness in meeting its mandates and to suggest recommendations for future improvement. 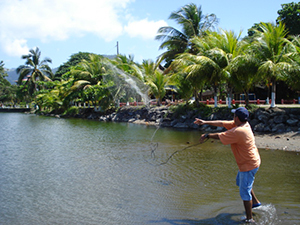 One of the major recommendations of the external review was to increase the CRCP's social science portfolio and use social science strategically to improve coral reef management by engaging local communities and better assessing the social and economic consequences of management policies, interventions and activities on local communities. The main purpose of the Socioeconomic Component of NCRMP is to answer the following questions: What is the status of human knowledge, attitudes, and perceptions regarding coral reefs? And, how are human uses of, interactions with, and coral dependence on coral reefs changing over time? The NCRMP socioeconomic indicators were developed through an iterative process. The indicators are intended to provide information that can allow CRCP to better answer the questions above. Resident surveys will take place in each jurisdiction every 5-7 years. These surveys will gather information from residents in Florida, US Virgin Islands, Puerto Rico, Hawaii, American Samoa, Guam, and Commonwealth of the Northern Mariana Islands (CNMI). Additional socioeconomic data will be compiled for each jurisdiction from secondary data sources like the US Census Bureau and local government agencies. The secondary data collection is focused on a variety of indicators. These data will be collected and analyzed at the jurisdiction level. Complete list of publications produced by the NCRMP Socioeconomic Team.